Deluxe, tropical home away from home. Set in lush exotic gardens it's a great place to escape and relax with a cocktail on the large patio. Great location for the beach, restaurants, bars and shops. The Villa is 1.5 from Khao Kalok Beach and about 30 min south of Hua Hin on the Gulf of Siam and 10 min from Sam Roi Yod National Park.. If golfing is your passion then check out the golfing opportunities at "Hua Hin After Dark" on the web...(6 international top class courses close by) . 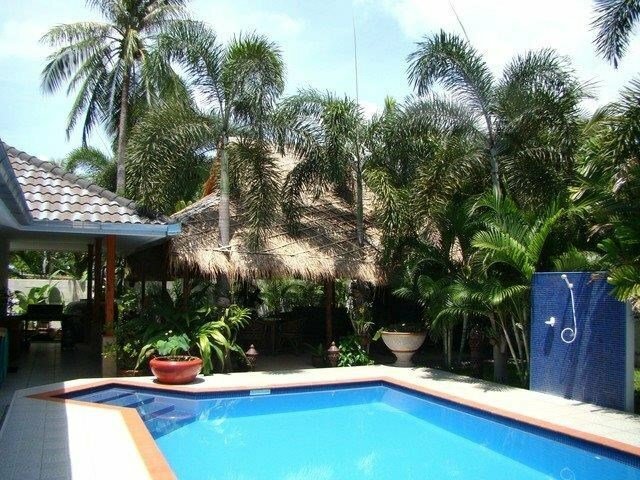 Great location close to beach, Thai / European restaurants and local fresh seafood and Thai produce. Also the area is now becoming popular as a retreat and numerous high quality exclusive day spa establishments are available. Once you arrive, you'll find numerous restaurants set on the beach road overlooking the beach itself. Pick the one that takes your fancy and relax for a few hours getting cooled by sea breezes over some delicious food and drinks. You will find prices here considerably less expensive than Hua Hin and the locals are friendly and always happy to see new faces. Hua Hin is the closest large regional Thai capital with a European influence and culture and has almost all services and amenities one would require. Local hospitals and staff are excellent. Also new Tesco and Makro superstores are about 10 minutes away so all supplies and specialty food items are available if required. .